Lawn & Landscape Challenges: Winter Moth - Minuteman Landscaping, Inc. The winter moth is a pest to be reckoned with. Their tiny oval eggs appear in November and continue through December. Initially, these eggs are green but after a short period, turn a pinkish-orange making them more visible. They can be found scattered along the bark, in bark furrows, on larger branches and under lichen. 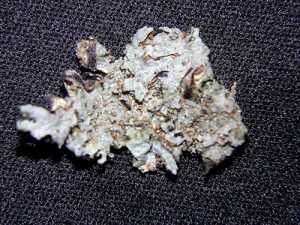 Prior to hatching in the early spring, the winter moth eggs will turn very dark. Magnified image of winter moth eggs. Typically, treatment is most effective when applied in the late winter or early spring depending on the temperatures. When applying treatment, it is best to apply when temperatures are above 45 degrees because below this range, there is a greater risk of causing damage to the plant. Winter moth eggs typically hatch in the Massachusetts area any time from late March into the second or third week in April. Winter moths attack a variety of trees including oaks, maples, fringetrees, apples, crabapples ash and blueberry. The winter moth caterpillars can also drop and feed on perennials including roses. The hatching stage is when the most damage can occur. The longer buds remain swollen but unopened, the greater the feeding injury potential. The winter moths can enter through the leaf and the flower buds. 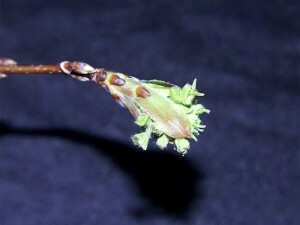 A Norway maple bud damaged by feeding winter moth caterpillars. 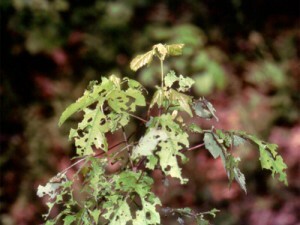 Once hatched, the caterpillars, also known as “free-feeders”, can move on the foliage and spread. In this stage till May or early June, the winter moth caterpillars drop to the soil and almost immediately spin a cocoon and pupate. As long as they are still on the host plant and exposed, treatment can be applied. We recommend scheduling for treatment as early in late winter, early spring as possible. The winter moth, first detected in Massachusetts in the 1990’s, is an invasive insect. The caterpillars are efficient defoliators and can strip leaves on valueable trees to lacy, Swiss cheese looking skeletons. If you have noticed any problems on your trees, please call us to schedule an appointment to have the winter moth treated. Damage caused by winter moth feeding.